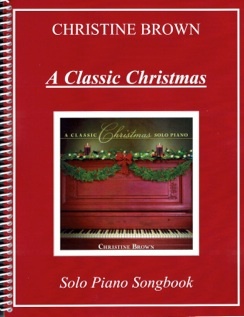 One of the job hazards of being a piano teacher and a music reviewer is that I can be so inundated with Christmas music from before Halloween (recital prep) until after New Years that I start hating it, so when someone comes up with a really different treatment of these chestnuts, my ears perk up immediately. 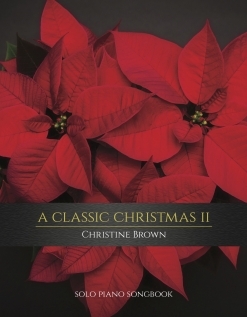 That’s the way I reacted to Christine Brown’s 2012 album A Classic Christmas, and I’ve been looking forward to the sheet music ever since. It’s here and what a delight it is to play! There are fourteen songs, but most of them are medleys of two or more songs, making the count quite a bit higher. I’ve played and heard lots of interesting combinations of songs, but I’ve never heard “We Three Kings” combined with “Fur Elise” or “O Holy Night” with “Moonlight Sonata” or “Coventry Carol” with “God Rest Ye Merry, Gentlemen” - great stuff and very different! And no, these are not meant to be merely entertaining - the arrangements are beautiful and the pieces work very well together. 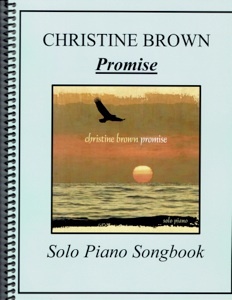 These arrangements (and one original piece) are not overly difficult, but not many pianists will be able to just open the book and play them well. They will require some practice to master, but then you’ll have something unique to play for the holidays. Not all of the carols are combined: “Carol of the Bells,” “Amazing Grace,” and “Silent Night” are stand alone pieces, beautifully and expressively arranged. “Christmas Medley” combines “We Wish You a Merry Christmas,” “O Christmas Tree,” “Christmas Time is Here,” and “Have Yourself a Merry Little Christmas.” “Santa Claus Medley” is “Santa Claus Is Comin’ To Town,” “Jolly Old Saint Nicholas,” “Up On the Housetop,” and a little bit of “Jingle Bells.” “Winter Stars” is a Christine Brown original. The book itself it also beautiful with full color artwork on both the front and back covers. It is spiral bound and printed on a medium-weight bright white paper. Spacing is excellent and the notation is easy to read. Suggested pedaling is marked and metronome settings are there if the pieces are not too rubato. There are pieces that pianists at an upper-intermediate playing level should have no problems with, but others are more difficult. Again, with practice, these pieces will be rewarding for many years to come! 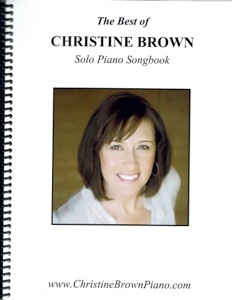 The book is available from www.christinebrownpiano.com. I give it my highest recommendation.